Since the days of its foundation, Drogheda has been steeped in tradition and its position on the Boyne ensured it as a hub for industry and merchants alike. No industry could more fully reflect the principles of tradition than whiskey distillation, and for centuries, Drogheda's master distillers brought an uncompromising commitment to the art of whiskey distilling. It is easy to forget Drogheda's once proud contribution to this very traditional art. 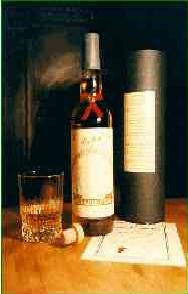 The first written record of whiskey production in Ireland appears in an Act of Parliament in Drogheda in 1556, the act made it illegal for anybody, with the exception of peers, gentlemen and the freeman of the larger towns in Ireland to make Aqua Vitae without a licence from the Lord Deputy. At its peak in 1774 Drogheda had 18 distilleries which would slowly decline to just one by 1822. The last distillery owned by John Woolsey became the first in Ireland to install an Irish built steam engine and by the year 1886, the year in which Preston brothers arrived, had one of the greatest outputs of whiskey spirit in Ireland. 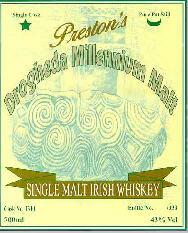 It is through the arrival of Preston Brothers that Drogheda's whiskey history is best remembered. The distillery finally closed down in 1968 and the last barrels of Preston's were removed from the bonded warehouses and sent to Dublin to be lost forever. Drogheda's part in whiskey distilling history is assured and we have brought this back to life for you to enjoy in the form of this unique and once off project. From the vast stocks at Cooley Distillery we have, along with the Master Distiller selected a single cask (number 1310) of the finest Malt Irish whiskey which we believe captures the unique character and flavour of Preston's. The whiskey was distilled in a traditional copper pot still and finally matured for many long unhurried years deep within the bonded warehouse. The spirit lay in a specially selected bourbon cask, with only the angels taking their share, until the master distiller choose the optimum time for bottling. Mid-way through the maturation period, one of the last full bottles of Preston's whiskey known to survive was added to the cask, infusing this unusual and very rare whiskey with a sense of place and history. The whiskey has a rich mellow flavour of great depth and unusual complexity, with the strong character of the original Preston's.